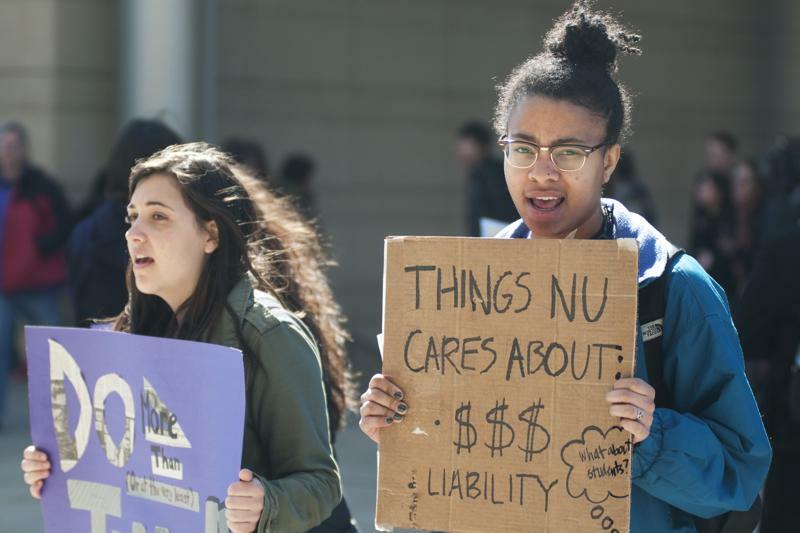 Students protest Friday outside the kickoff of Northwestern's $3.75 billion capital campaign. The protest was the latest in student efforts to spur a dialogue on how NU handles sexual assault and misconduct. Protesters held signs, chanted slogans and distributed pamphlets to the more than 500 faculty members, students and alumni who attended the formal launch of NU’s $3.75 billion fundraising initiative at Pick-Staiger Concert Hall. The group, composed mostly of students, gathered to ask administrators for greater transparency in cases involving sexual assault and harassment. Their requests also include a termination clause applicable to any faculty member found in violation of NU’s sexual misconduct policy, which explicitly prohibits sexual and romantic relationships between faculty and students. It is the second protest on campus since a Medill junior filed a Title IX lawsuit against NU in February, alleging the University mishandled her complaint that philosophy Prof. Peter Ludlow had sexually assaulted her in 2012. Ludlow cancelled his 300-level philosophy class last week after students planned a group walk-out of the class. Despite the cancellation, students gathered to protest and march to the office of Sarah Mangelsdorf, dean of Weinberg College of Arts and Sciences. Since last week’s protest, students have met twice with administrators to discuss their concerns. On Wednesday, the University announced Ludlow would not be teaching his scheduled Spring Quarter philosophy class. Associated Student Government president Ani Ajith was the only speaker during the planned program to speak about the protest. During his speech, he said the protestors’ presence was evidence of their commitment to making NU a better place. Administrators responded receptively to the students’ presence. University President Morton Schapiro said he was “proud” of students for advocating for a safer campus. About 30 protesters returned at the close of the event. Students chanted slogans such as, “We want protection, not a new building,” as members of the NU community exited the area. Correction: The article’s headline has been changed to reflect that students were protesting outside of the kickoff, not protesting the event itself. The Daily regrets the error.